I first tried burdock root salad 7 years when a friend decided to order it at Izakaya restaurant on Front St East (it’s no longer there). I thought the name sounded totally strange and had no idea what to expect. I was pleasantly surprised with the crisp texture that held the strong flavour of the dressing which had hints of sesame, soy, ginger and chili. I purchased prepared burdock root salad at Sanko over the past few years. 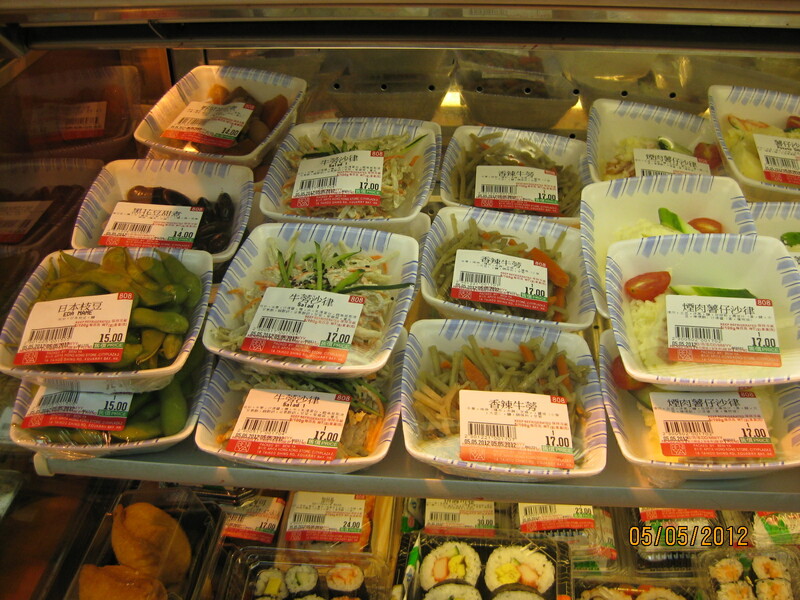 On my last trip to Hong Kong, I rediscovered burdock root salad in the prepared foods section of Apita, a Japanese department store that was close to where I stayed. I so enjoyed the slightly spicy, savoury taste and crisp texture of this salad that I bought it several times for lunch. When I came back to Toronto, I asked Chef Melissa Saunders if she had tried burdock root salad and she had many years ago as well and quite enjoyed it. I’m very excited she has put it on her menu this week. I cannot wait to try her version. In addition to being a crisp root vegetable that lends itself to tasty flavouring, burdock root is high in fibre and potassium, and has small amounts of iron, calcium, zinc, magnesium, folic acid, vitamin C and E. The fibre in burdock root is naturally occurring inulin, a soluble fibre and prebiotic, which is now commonly added to foods to boost nutritional value and fibre content. Try burdock root salad when you get a chance for the interesting taste and nutritional benefits. 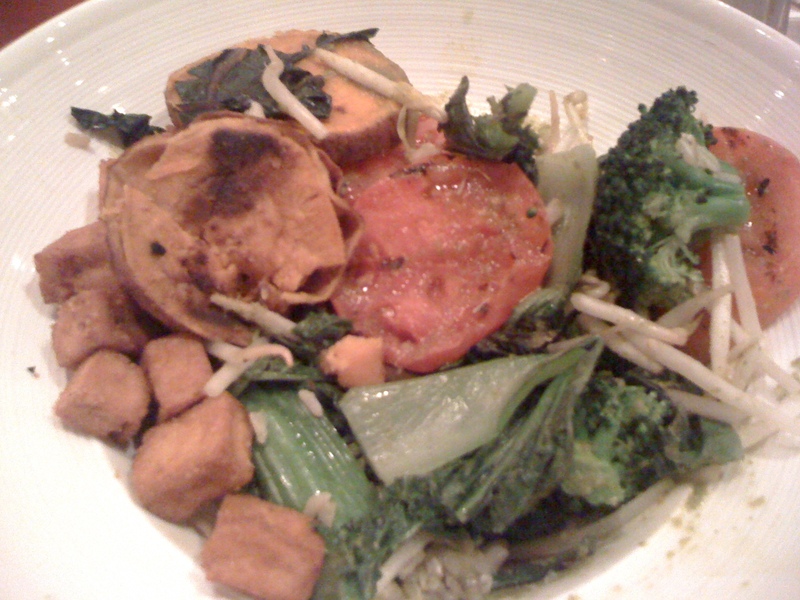 Fresh is a vegetarian restaurant that I have been to on quite a few occasions with friends for a quick, healthy meal. 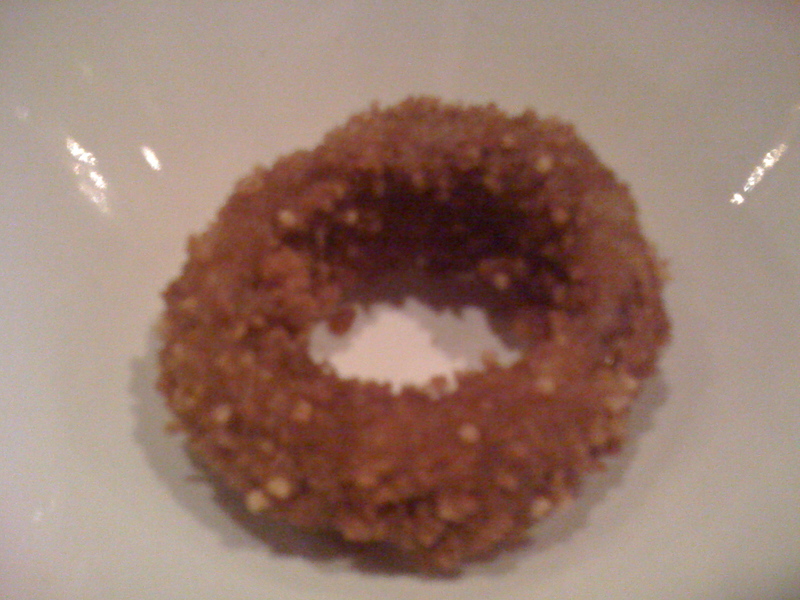 The quinoa onion rings are my absolute favourite and must be ordered every time I go there to share. They have a perfectly crisp coating with a tender onion centre. The combination of crispy tofu, bok choy, sweet potato, tomato, brown rice with the green dressing is a satisfying taste and texture combination. I don’t typically choose smoothies and juices at restaurants, but the Fresh drink menu is very appealing with its large array of smoothies and fresh juices. The latest one I tried had the most appealing name of eternal youth. The eternal youth smoothie tasted great while including kale and E3Live. Fresh is a great option to try delicious vegan and vegetarian meals with familiar foods like onion rings in the mix. Vegetarian diets have numerous health benefits and trying a vegetarian meal at home or at a restaurant like Fresh is a great place to start. Expanding the variety of foods you eat, especially plant foods is always a great idea as it increases the variety of nutrients you intake. This a recipe I came across and adapted while studying vegetarian nutrition. I enjoy it as a vegan main dish with brown rice pasta, and find I feel satisfied and energized after this meal. Some little people I know love it as well. It is a great way to have a few different vegetables at once. I find this particular mix of veggies the best tasting, but any veggies you have on hand especially ones you need to use up, is good to try. In a large saucepan, saute onion, garlic, carrots, celery and cauliflower in olive oil over medium heat until softened, about 5 minutes. Add the tomatoes, lentils, and oregano bring to a boil and reduce heat to simmer for 15 minutes. Add finely chopped swiss chard or kale and simmer for 5 more minutes. Season with salt, pepper and lemon juice to taste. Use an immersion blender if smaller discernible pieces of vegetables are desired. Callaloo was a most delicious green veggie I tried while I was in Jamaica in March. I was told it was like spinach, but a bit milder. I first had it in a mixed vegetable curry, which I quite enjoyed. 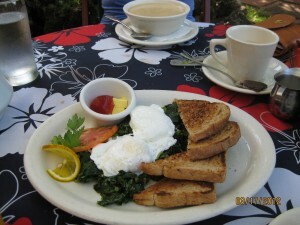 I had it again for breakfast in a dish of poached eggs and steamed callaloo. Callaloo provides vitamin C, folic acid, iron and calcium. I found it to be delicious just steamed, so I highly recommend it as a green veggie to have regularly-it tastes good! Having more greens is a tried and true strategy for better health and fat loss. This concept gets much easier when there is a green that is this tasty. A Jakes employee showed me callaloo growing wild by the side of the road. This is unlikely here in Canada, but be sure to try callaloo if you have the opportunity to do so in the Caribbean. Or at a West Indian restaurant in Toronto. Or try to buy some at a specialty market-I will do so and report back. I got my hands on some callaloo at a Caribbean store in Kensington market. It was imported from Jamaica, but it was definitely a fresh cut plant. I cooked it with the help of a good friend yesterday and it was delicious! I came across Bi Rite Market under the most unlikely circumstances. I inadvertently had dinner with two separate groups of 6 people at Mission Chinese in San Francisco. One of my absolute favourite Chinese restaurants ever. 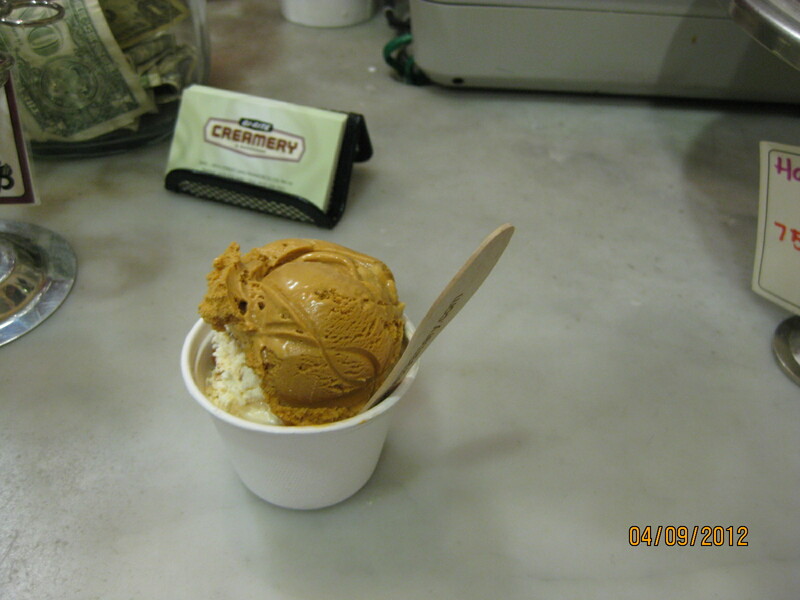 Both groups of 6 people highly recommended icecream from Bi-Rite Creamery, which was 2 blocks away. I made my way over after dinner and lined up for 15 minutes for their salted caramel icecream. When I paid for my icecream, I noticed their book for sale and made a mental note. The icecream was unbelievable. Creamy, rich with just the right balance of sweet to the hint of salt. Well worth the lineup. As I walked back, I passed by Bi-Rite Market and they had just closed. I had thought it was a flower shop on my previous trip to San Fran on my way to dinner at Delphina, but it is actually a neighbourhood market. I pretty much pressed my nose to the window and got the impression that everything was carefully selected from partnerships with farmers and the prepared foods menu was inspired and changed frequently. I ordered the book upon my return from San Francisco. I devoured the book upon its delivery. The story that Sam Moggannam tells of his career as a chef and his transition to the family grocery business is genuine and passionate to a point of inspiration. This book is a great food education resource and I would highly recommend to anyone with an interest in good food. Eat Good Food is helpful in gaining a clear understanding of how important it is to prepare and enjoy good food to the fullest, why it might cost more and how it is still a good value. It is admirable that the Moggannam family has built an exceptional business based upon their mission of creating community through food. The details about how to select good food from all sorts of meat, veggies, fruit and dry goods are exceptionally clear and educational. I have yet to try the recipes included in the book, but they look very appetizing with quite a few ideas to try. The Delphina’s spaghetti being the recipe I most want to try first, as it was exceptional in its simplicity when I ate it at the restaurant. Many of the recipes in the book appear to be simple to execute for some easy delicious meals. I really look forward to trying them. I was really impressed with the icecream, which is another part of their family business and now truly inspired by their book! I have never thought of Hong Kong as a source of workout inspiration with its urban hustle and bustle. Since my childhood, I have always known my grandparents to get up early to go for long hillside walks, tai chi and dim sum. I finally experienced a hillside walk myself on this trip. My brother Matt, who is also a physical educator and I brought our family out for a great long walk on Saturday morning in Quarry Bay, Hong Kong. 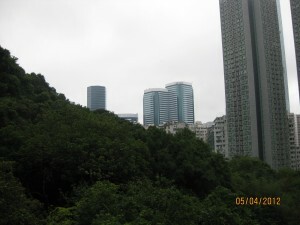 A good portion of the walk was uphill complete with lush green scenery all around looking out onto the urban development below. As you can see, Matt was ahead of me in form and number of chinups done. I need to work on this! The whole experience of a family outdoor activity was an amazing eye opener into healthy, active daily living in a bustling city. The walk was also a great workout. Walking briskly uphill can be pretty strenuous and so are chinup bars! For a dense, super urban place, Hong Kong has many easily accessible and highly scenic trails and parks to walk or run and enjoy great views. 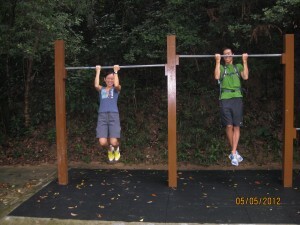 In addition, their government seems to have invested in having exercise apparatus such as chinup bars and balance beams complete with instructions easily accessible within parks. What a great way to encourage activity. 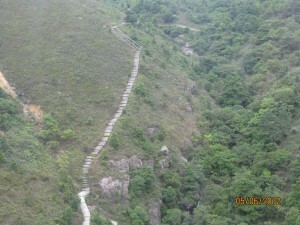 We even found some serious workout inspiration on our ride up on the cable cars to see the large Buddha. 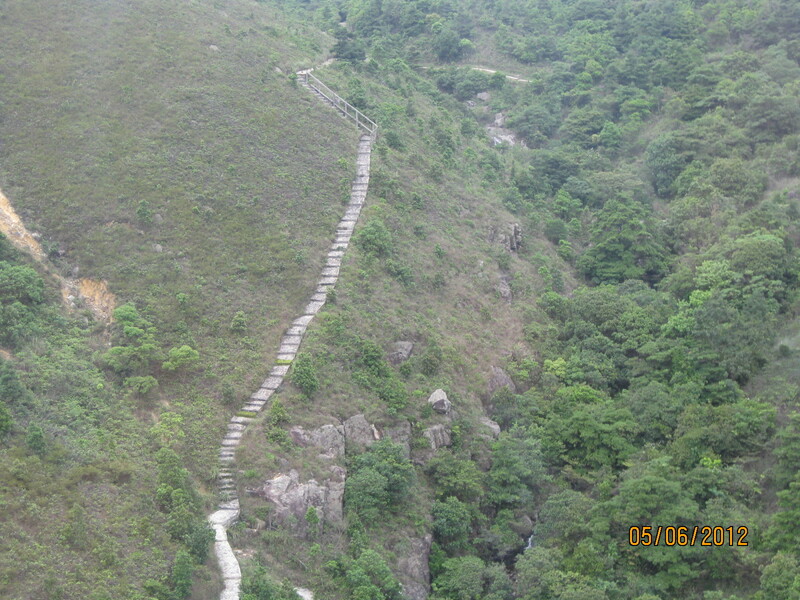 Those are some serious stairs, I would like to climb one day. I introduced a friend to Buca last night after we checked out an ambitious photo fundraiser by Zark Fatah on King W. We started with roman broccoli, which was perfectly cooked and so deliciously seasoned. The lamb skewers were also excellent. Pizza was absolutely necessary. Octopus and clam was one pizza and I ordered the one with poached tuna, olives, fresh chili and bottarga. Both were an incredible food experience-varied and bold flavours with the unfailingly crisp thin crust. I was just educated on Monday at the Terroir symposium on what bottarga is. As I understood, it is fish roe that has been preserved in wax and it is used to add umami to dishes. My tuna pizza certainly was a taste sensation, with plenty of umami. Chef Melissa Saunders and I coincidentally have an aversion to tiramisu. However, we were both convinced on separate occasions to try it at Buca, due to their appetizing presentation in a cocktail glass. It was the best tiramisu I have ever had, because I actually liked it! Strawberry was the new version, with house made dried strawberry adding an extra dimension of flavour and texture. Just another outstanding dining experience at Buca.